Piney Z home sales were down significantly in 2011, and a new "low" was hit with only 28 homes sold in 2011, down 10% from 2010. This means we have seen 8 straight declining years, something that I have not seen often from the rest of the Tallahassee real estate market. Typically, when we see unit sales decline faster than the rest of the market, we are experiencing a Tallahassee neighborhood where home owners are “holding on” trying to find higher prices. This can work for a short period of times in a stronger market, but at some point, capitulation will kick-in and we'll see major price declines as Piney Z home sellers compete with each other for the declining buyers. I suspect we will start to see homeowners begin to be overcome by the market momentum this year and home values will likely decline at a rapid rate. This has happened in other areas of the Tallahassee real estate market when home sellers held onto their asking price while the rest of the market continued to decline. 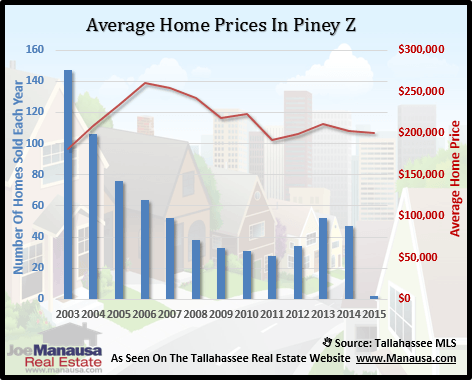 Don’t expect Piney Z home sales levels to return until home sellers begin to price their homes competitively with the rest of the homes for sale in Tallahassee. Reminder: This Sunday is Super Bowl Sunday! Please check out the Joe Manausa Real Estate Super Bowl Commercial in the third quarter and tell us what you think! 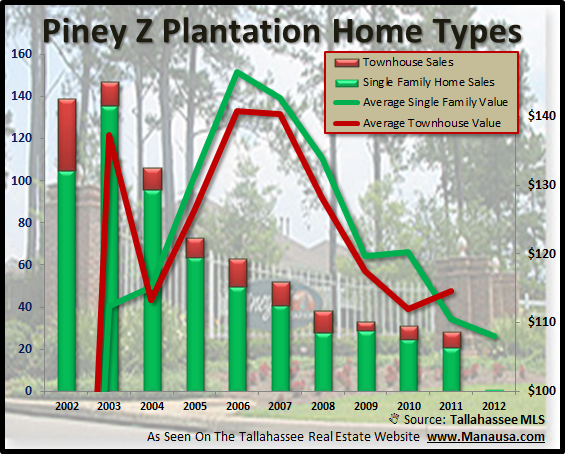 The following map shows Piney Z Home Sales for the past few years (you must view the map on the Tallahassee Real Estate Blog site). Just click on any red dot to see the details of the sale. Piney Z Home Prices have dropped from a high average of $260K established in 2006, to the current level of $192K set last year (it's too early to establish a price point for 2012). This is a decline of 26% which is stronger than much of the rest of the Tallahassee housing market, but falling fast. The graph below shows unit sales (green for arms length, red for distressed sales) and average prices are plotted in brown. Piney Z home values have dropped even slower than prices, with the high in 2006 of $145 per square foot having dropped 23% to $111 per square foot in 2011. If I were a homeowner needing to sell a home in the next few years, I would sell it now and sell it fast. 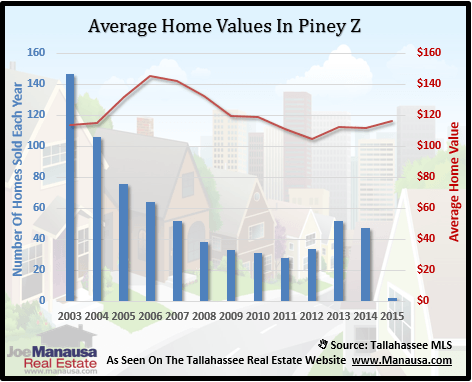 Value changes will catch up with the rest of Tallahassee, and this means that if you must sell a home in Piney Z, the highest value that you will receive over the next five to seven years is right now. When we look at Piney Z home sales, segregated by property type, we see something a bit unusual... Last year, the average townhome in Piney Z sold for a bit higher than in previous years, while the average single family Piney Z home value plummeted. I think we'll see this trend (for town homes) reverse this year, as single family homes drop down close in price to single family homes. Please check back again in the future for more Piney Z home sales reports.